Hello friends, thanks for checking in today! If you're visiting from the link-up, I'm glad you're here! 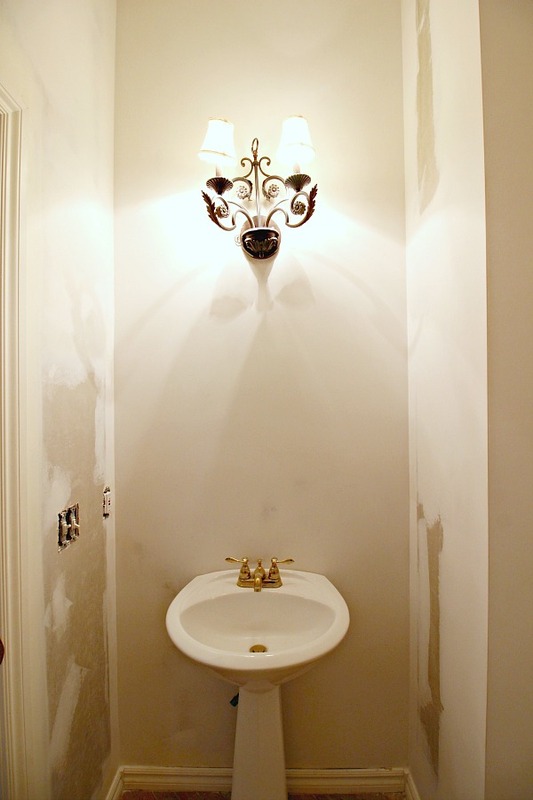 I'm working to make over my Powder Bath in just 6 short weeks, taking it from dark and dated to fresh and fabulous. This week, the name of the game was patience. As a reminder, last week I stripped all of the wallpaper, and because the walls weren't prepared properly before they were papered, there was damage to the drywall from removing the paper. So.... I was at the mercy of my drywall repairman before I could proceed. Fortunately, he worked me in pretty quickly, but didn't start until Saturday and had to come back Monday and Tuesday to finish the process. I debated DIYing this, but in the end decided this was a job best left to the professionals. So, here's where we were Tuesday evening... smooth, patched up walls! I had to wait overnight for the final repairs to fully dry, so yesterday I was able to prime the walls. Yay for a blank slate- finally- but our time is half way gone... yikes! Pretty, right? I was kind of all over the place between modern and traditional styles. I'll keep it a secret a bit longer which ones I chose, but I will say that they arrived yesterday, and they are FAB.U.LOUS!! I can't wait to get them installed! Another piece fell into place at just the right time. 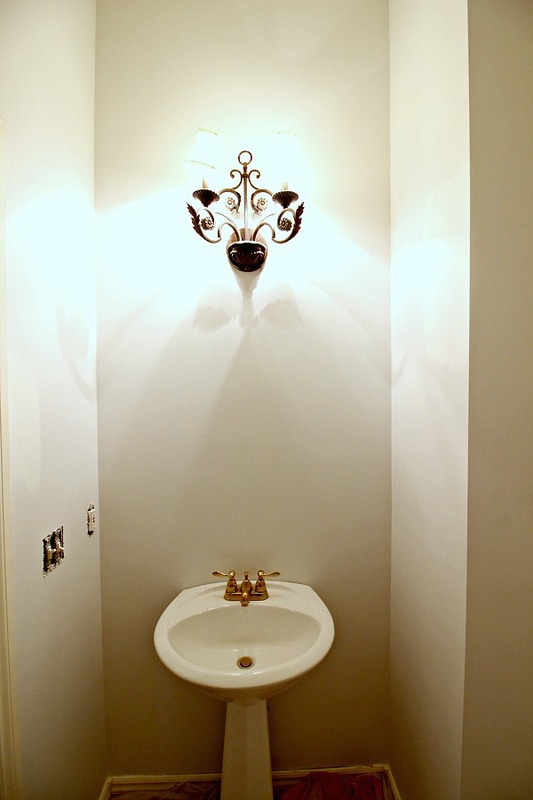 The mirror is a La Barge replica and the perfect size for above the sink. I found it on my local Facebook garage sale site! Do you use them in your area? I'm starting to love those sites more and more! 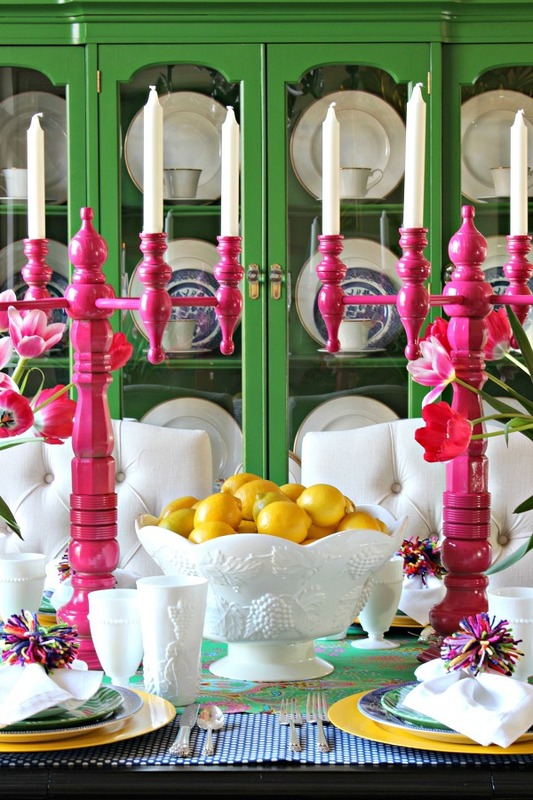 There will definitely be some pops of color in the room, and I'm strongly leaning towards painting the mirror frame "Mambo Pink", the same bold glossy spray paint that I used on the candelabras for my Spring Tablescape. I'm going to wait until the room gets a little further along to decide for sure. The room has wood flooring already, but I like to keep a small rug in front of the sink. 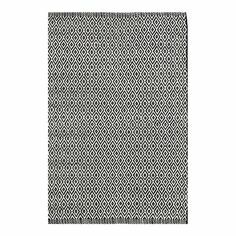 I think this small graphic print black and white rug from Mintwood Home will be perfect to complement the design on the walls. This print will go on the wall in the sink area. Spots on a spotted wall? Why yes, I think I will! I've loved giraffes since I was a little girl- not so much that I want them all over my house, but I couldn't resist this spunky guy! He arrived yesterday as well and is SO cute in person. I'm a little stumped on the rest of the artwork for the room. Other than a few things on the wall around the sink, I'm not sure yet on a direction for the rest of the room. Previously I had two complementary prints hung together on the largest wall, and that seemed to work alright. Remember, the room has a strange footprint. 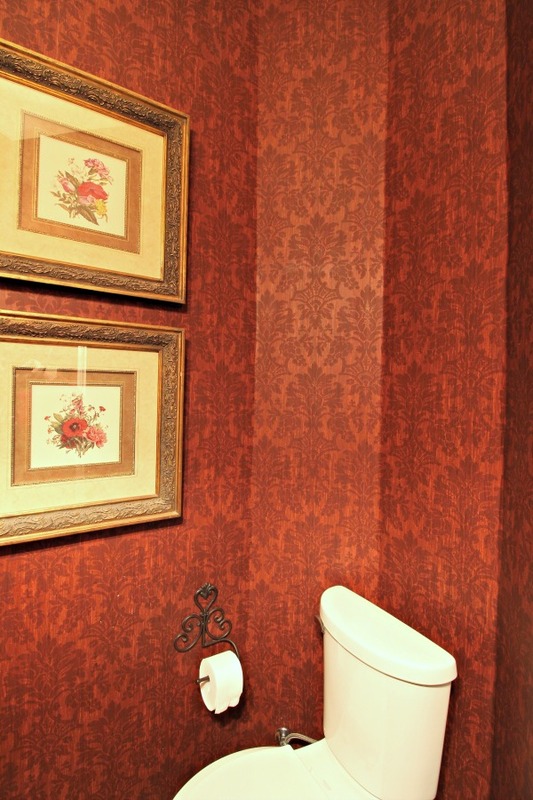 Beyond that large wall 3 small walls kind of come together to wrap around the toilet, so the large wall really makes the most sense to use. Putting anything anywhere else just seems like too much in the small space. I'm thinking of using some oversized palm leaf prints, like Sarah's, but I'm definitely open to suggestions for what to do on these walls. I'd like to give a huge thank you to these companies for partnering with me on this makeover. I've shared a few of them with you today and will tell you more about the others in the upcoming weeks. I always love what you do Jennifer- especially when you find a mirror as fabulous as that! Your ORC is on its way! I love all of those lighting choices! I don't know why but I just feel like #6 is so you! Love this little guy! I used a flamingo in our little girls spotted room. I can't get enough of those animated animals! 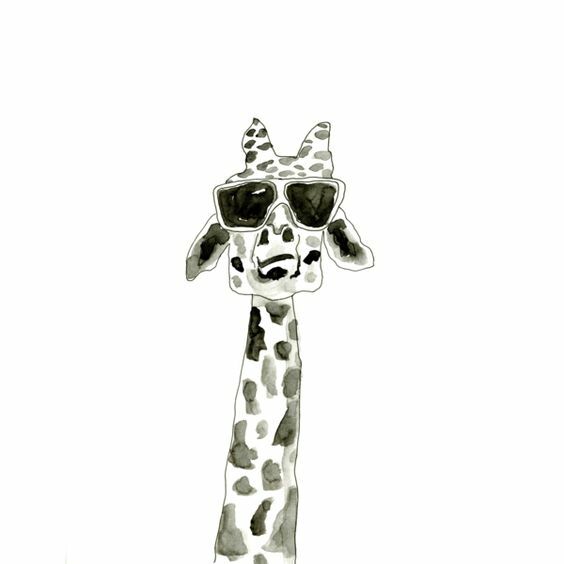 It's funny because as I was reading this, I was picturing palm art with your giraffe...then you mentioned that inspiration! Love following along. Best of luck this week. Yay for a blank slate! Things will come together quickly now that you have most of the pieces! It's going to be fabulous!! I've never heard of FB garage sale listings, need to check it out - that mirror is fab & am so excited that it may be bright fuchsia! Dots on dots is always a good idea! Love all the ideas!!! 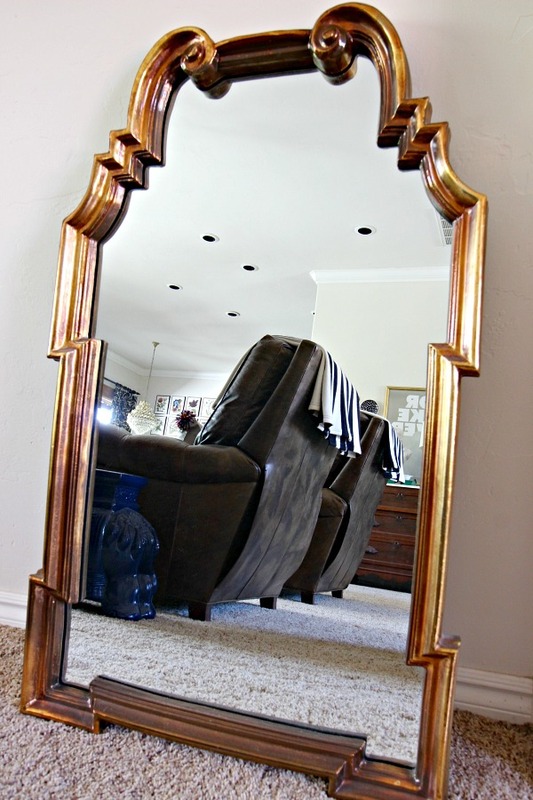 I gasped when I read your idea about painting the mirror. Great idea! I was thinking about your artwork. What about a large painted canvas with a monogram on it? Or with a Pom-Pon wreath? You could paint the canvas your signature green, a bold black and white stripe, or Modge Podge it with floral wallpaper. Then you could switch out the layer over it with your monogram, Pon-Pom wreath, a silver platter, wooden charger, or your white feather-hat whenever the mood strikes. For some reason I have had better luck with larger artwork in smaller spaces. I'm sure whatever you choose, it will be fabulous! Any of your options would look fab and knowing you Jennifer, with your love for all things colorful and lively, you can make whatever you decide on work!!!!! OHHH! So much pretty happening! I vote 1, 2 or 5 for the sconces, and definitely a YES on the palm prints. You are going to nail this! Thank you for "playing the game" and keeping us involved in the decisions for your ORC. It is fun to watch your choices unfold. 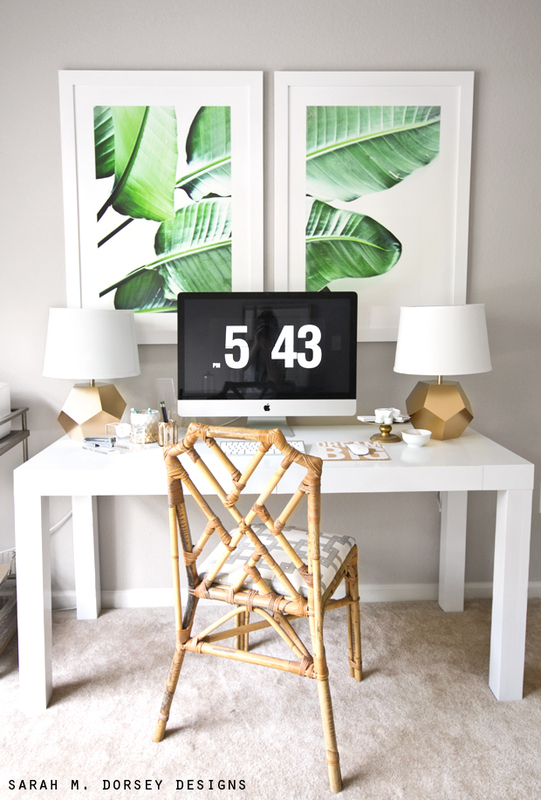 Love the mirror and giraffe print! Excited to see the room come together! Love all those lights! And that mirrors is fabulous and I can so imagine it in pink. Looks great! I love everything you are doing. You are very inspiring! So fun to watch this coming together! You were very wise to get a professional to do the walls. We painted some that had not been fixed well after removing wallpaper, and it looked awful. I have that same mirror and love it! As much as I love color refreshes, it would be hard for me to let go of that pretty gold. As for art, have you seen the Beverly series by The Aestate? They are really neat and remind me of the banana leaf ones. Just came to mind as I was reading. Looking forward to next week! Also fixture 6 is amazing! 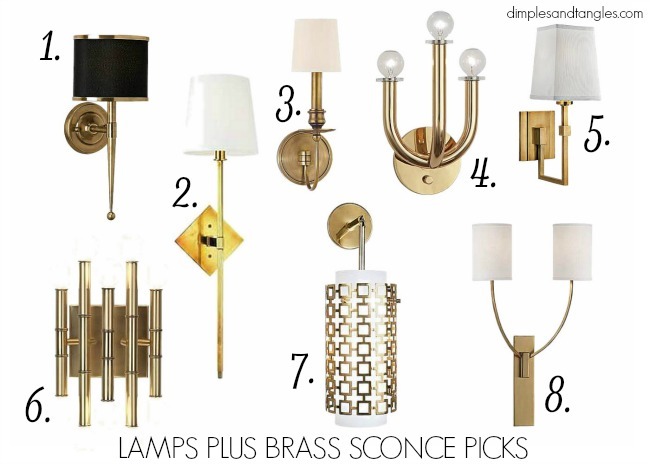 I'm sitting here trying to figure out where I need sconces. I can't wait to see what lights you chose, Jennifer! And that mirror!!!! Whoa baby. Love it! DYING over all of those scones - how can you go wrong? And loving the other plans for your room - that mirror was a score! All those lights are amazing as is that mirror! I just discovered your blog through the ORC! Love how your bathroom turned out in the reveal and I'm catching up on your progress posts. Is there any way you could recommend your drywall repairman? I live in NW OKC, and we're currently updating our half bath. The lower portion of the walls was damaged after removing the old bead board. We've tried to find someone to replace and patch the damaged areas, but no one will take the job because either 1) the job is too small, or 2) they won't do a smooth-coat finish--only textured. Anyway, yours looks AMAZING, so I thought I'd ask!